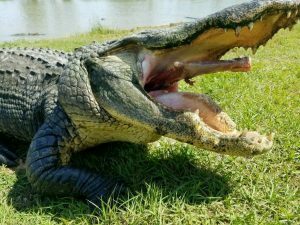 This past week we sat down with our farm friend Captain Crunch for a quick interview about #swamplife and what he’s been up to this summer at Alligator Alley. He shared with us his best #alligatoralleyadventure and we snapped a few headshots of him before he snapped into his lunch! Check him out! Here’s a quick update before we dive into his Q&A: Captain is in his late 30s, he’s 13’2” and 800+ pounds – now that’s what we call a big fella! Q: We hear you have a world record for bite strength – what’s your favorite food to munch on? A: Anything I can get close to! Top favorite – feral pig leg (but not from my friends on the farm!). Q: Where’s your favorite sunbathing spot? 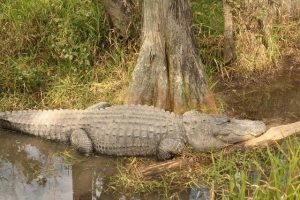 A: I prefer to be alone in the swamp covered in mud and scouting out my next meal. I don’t typically bask in the sun… unless there’s snacks. Q: How did you earn the name “Captain Crunch”? A: I own this place, so the name Captain is quite fitting. The ‘Crunch’ doesn’t need an explanation, right? Q: What’s the biggest adventure you’ve been on at Alligator Alley? Captain Crunch heard the dinner bell and quickly scurried away to beat the crowd. 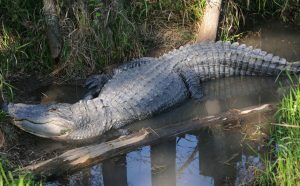 Do you have any questions for Captain or one of the other alligators? 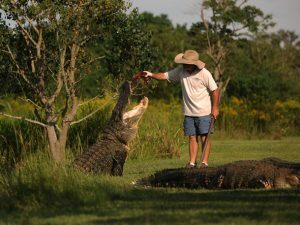 Shoot us an email at info@gatoralleyfarm.com and we’ll add you to our newsletter, where you can receive updates on all things Alligator Alley! 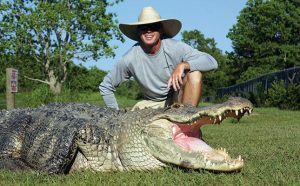 For now, check out our profiles on a few swamp favorites here. Remember, we’re open seven days a week, 10-5 and have live feedings every day at 11, 1 and 4. Tune in on Facebook soon to spot Captain crunching on some lunch!